MADISONVILLE - Melvin Larce Johnson, Jr., 65, of Madisonville, died Sunday, July 15, 2012 at 11:40PM at his home. Mr. Johnson was born March 30, 1947 in Muhlenberg County. He was a coal miner and member of Browder Chapel Missionary Baptist Church. He was a U.S. Army veteran. He was preceded in death by his parents, Melvin Sr. and Lena Johnson. Survivors include his wife, Rosalind; son Clarence (Sandy) Carter of Henderson; daughter LaShawnda "Shuggie" (Joseph) Hancock of Madisonville; grandchildren Dai' Tearrence Carter, Jakar Belle, Chaseton Hancock, and Tatyana Carter; brothers Harold Edward Johnson, David Lynn Johnson, and Larry William Johnson, all of Belton; and sisters Margaret Ann Johnson of Browder, Rachel Kay Drake of Belton, Theda Carol (Mike) Quarles of Hopkinsville, and Patricia Mae Johnson of Beech Creek. Funeral services will be Saturday, July 21, 2012 at 1:00PM at Tucker Funeral Home in Central City, with Rev. M.L. Quarles officiating, assisted by Rev. A. Johnson. Burial in Burgess Cemetery. Visitation will be Saturday after 11:00AM at the funeral home. Online condolences may be made at www.tuckerfuneralhomes.com. 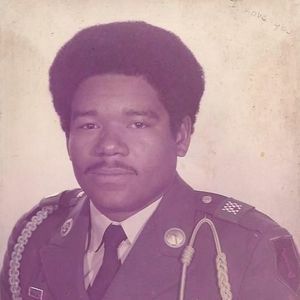 Create An Online Memorial For Melvin Larce Johnson, Jr.
R.I.P uncle melvin. Love you. So sorry about your loss,I worked with Melvin at colonial mine for several years. So sorry to hear this about Melvin Jr. He was one of the nicest people ive ever met. My thoughts and prayers go out to his family. Been friends of the family all my life. To the Family, I extend my heartfelt sympathy in the passing of your husband, brother, granddad and friend. He is at peace now, no more pain or suffering. My prayers go out to you. Always remember the good times and that wonderful smile he had. May God bless you all. Hope to see you on Saturday. I am sorry to hear of the passing of Melvin. Melvin was alot of fun to be around and was always nice to everyone . May GOD wrap his everloving arms around each of you and provide you comfort during this time of sorrow. The LORD is my light and my salvation; whom shall I fear? The Lord is the strength of my life; of whom shall I be afraid. Wait on the LORD, be of good courage and he shall strengthen thine heart. Wait, I say, on the LORD. I worked a lot of years with Melvin at Multi Care. His smile was the high light of the day. Have never meet a person as kind as Melvin was,always had that smile!!! He will be greatly missed. God Bless his Family. i worked with melvin at multicare. he always had a smile on his face , he made your day better just by saying hello. he always offered to start our cars when it was cold ,and we took him up on it . it was nice when you were getting off at 8:30 pm or 9:00 to get into a warm car. he was just a very special person and i will miss him. Thinking of Theda and the family during this time of loss. God bless. Condolences to the family....May God be with you during this time.